The location is amazing - you have the fealing that you are in a jungle. The cabana was really nice, the bed very comfortable and we enjoyed a lot the terrace. The breakfast was really good- we had fresh fruits from the garden. The host is really nice and help us with everything. I totally recommend this place. The cabanas are so cozy with the wonderful smell of wood. If feels very romantic to sit on the private patio and watch the wildlife in the garden. The Bed was very comfy, the room has a kitchenette with breakfast facilitties, a fridge and an outdoor bbq area. We had breakfast which was excellent, lots of local produce on offer. Fresh fruits, Omelett. The beach is 2minutes walk down the road. The cabanas are absolutely amazing, like a luxury tree house, its ideal for coupl, as we enjoyed our time at a peace in paradise so much. the staff are very helpful and will give advise on things to do on the island. This place is absolutely lovely and peaceful. Located on the southern part of the island and a little quieter than other areas. The host cooks awesome breakfasts in the morning and pretty much leaves you to it the rest of the day. We got upgraded to a villa which was absolutely wonderful. Amazing wooden igloo, inside a huge beautiful garden that is maintained personally from the owner Mrs Erada. This place is literally a peace in paradise! One of the most beautiful accommodation I have ever been to. Lush garden full of tropical birds and blossoming flowers. Eco cabanas nicely smelling of fresh wood and the terrace surrounded by green plants that gives you the best shelter to switch off your mind and really fall into a deep relaxation mode. Thank you so much for a really great stay and for showing us the great hospitality of Seychelles. Very nice owner, nice accommodation, and a great location! We had a great stay in 'A Peace in Paradise'. We stayed in the Villa which is very spacious and has a nice balcony with a comfortable swing to enjoy mornings/evenings/days in it. From there you also have a great view of the wonderful garden in which the whole place is located. The apartment is fully equipped with everything you need. Small shops, restaurants and the beach can be reached within five minutes by foot. The next bus stop can be reached within ten minutes by foot. Stephen is a very friendly host, who is very helpful to his guests. Stephen was very helpful and always willing to assist in whatever you required. I enjoyed my stay here and the location is pretty good. They are busy upgrading for an even better experience. Will surely go back there. Its literally peace in paradise. Calm and not much happening around you. So quiet all the time. Some great birds spotted. Lock in a great price for A Peace In Paradise – rated 8.8 by recent guests! One of our best sellers in Baie Lazare Mahé! Set among the dense natural vegetation and beautiful tropical gardens and a 5-minutes' walk from the beach, A Peace In Paradise offers self-catering accommodations on Mahe Island. Guests can enjoy ample space to relax and enjoy a peaceful stay. Free WiFi is available in the public areas. A Peace in Paradise offers self-catering units with private bathrooms. Some units have a fully-equipped kitchen, while others have a mini kitchenette. All units have air conditioning and a private veranda overlooking the garden. Towels and bed linen are provided. Other facilities at A Peace In Paradise include a barbecue. Car hire is available at the property and the area is popular for snorkeling and diving. Guests can enjoy various activities in the surroundings, including fishing and hiking. Seychelles International Airport is 5 mi from the property. When would you like to stay at A Peace In Paradise? This self-catering villa is air-conditioned and and includes a bathroom fitted with a shower. Guests are provided with free toiletries. The dining area and kitchen come complete with an oven and microwave. Towels and bed linen provided. This eco-friendly cabin is equipped with a kettle, toaster and mini fridge. Guests have access to a communal outdoor cooking area. This eco-friendly cabin has an private bathroom and a private patio. It is equipped with a kettle, toaster and mini fridge. This wooden chalet has a bathroom with a shower and a private veranda overlooking the garden. It is equipped with a kettle, toaster and mini fridge. A Peace in Paradise villa and Eco friendly Wooden log cabanas, have been created to blend in our tropical forest. We operate a RESPONSIBLE TOURISM POLICY at all our properties. Our Aim is to encourage all our visitors to be responsible for their visit to our island and to protect our fragile environment. All our property is very secluded and set in a beautiful botanical garden away from the busy environment for guests to enjoy a holiday in nature, with an abundance of birds and tropical plants. Our villa and cabanas is a 50 metres walk from the main car park. all our wooden cabanas are set in wilderness were you can enjoy a stress free time. Our guest can enjoy outdoor bathing in the outdoor rain showers. All our properties are rented on a self catering basis, our guests must take care of our property and observe our House Rules during their stay with us. 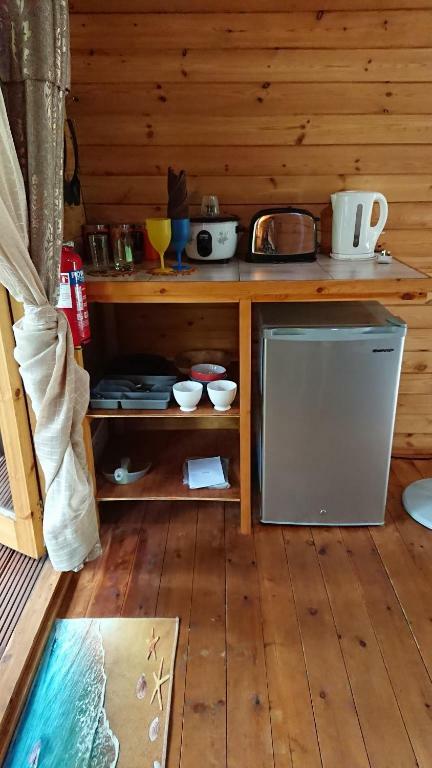 Our small wooden cabanas have full bathroom ensuite facilities, mini kitchenette for preparing light meals, an outdoor gas cooking area and BBQ is also available for cooking main meals. The cabanas are ideal for couples, Honeymooners, or Solo travellers. The villa is suitable for families and has a full kitchen. A very peaceful and quiet neighbourhood in the South west of Mahe Island were guests can enjoy some of our most beautiful beach on the island, like Anse soleil, Anse Takamaka, Baie Lazare Beach, all a few minutes drive from the property. Shops and restaurants are a few minutes walk down the road. House Rules A Peace In Paradise takes special requests – add in the next step! This chalet does not accommodate children. A Peace In Paradise accepts these cards and reserves the right to temporarily hold an amount prior to arrival. Please inform A Peace In Paradise of your expected arrival time in advance. You can use the Special Requests box when booking, or contact the property directly using the contact details in your confirmation. Beautiful place with birds, bats, frogs. I loved this little jungle....pure nature, calm. We spent 10 days. Every moment was so amazing! Breakfast was good, lot of fruits, egg, creol food. The hosts Stephen and Erade were extremely helpful. Erade helped us to make our stay as comfortable as possible - we even had the chance to get to know her incredible Creole cooking skills - it was a wonderful dinner, and great breakfasts. The garden, the cabanas - everything was just beautiful. Waking up hearing the birds sing and the sounds of the jungle was amazing and very relaxing. We had a perfect stay. Amazing garden, so peaceful and well maintained! Bungalows and villas are very good. Get a villa if you have a chance - it is spacious and very comfortable. - The Wi-Fi connection is really unstable and slow, house number 5 has no wifi. - If you will lose the "key" (check photo) it will costs you 55€/65$! - The entrance door is not working well, the splint hooks. - There will be no responsibility for injuries but the cables for the light spots lay broken on the ground (see photo)?? - The woooden cabin is not really finished: there are no hooks for the towels, there are no wardrobes, the doors hook and grind (the wood grows after = needs rework) - There are sharp and moldy edges at the shower and also in the shower it's moldy (see pictures). - The telephone number of the owner at booking.com is not working All-in in our opinion the price of 100€/120$ is to high. We would say 80€/95$ is okay. And this place needs some rework. The full amount of our stay was debited 11 days before our arrival! This is a no go to have to pay for something before you get any service!! In reputable hotels you have to pay at the departure. - The Owner is friendly and helpful - The garden is pretty nice and the wood chalet gives you a nice atmosphere. - The bed is quite comfortable and the balcony is a good place to hang out. - The location is near the "Anse a la Mouche", it's just 400 meters away. The location is a little bit in nowhere... So if you have car its ok but not the best choice... If you dont have car its totally a problem! Loved everything and the garden and cabanas are absolutely amazing. Best vacation. The cameras in and around the porch area of the villa felt like someone was watching us all the time. Not sure if they were on and it's a big property so security is necessary - it just felt a little odd. Other than that we loved our stay there.